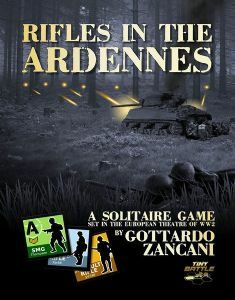 Rifles in the Ardennes recreates the tense action that characterized Ardennes in a unique single-player format. Designer and Artist Gottardo Zancani has replaced the literal map typical of World War II games with a stylized track, allowing for endless customization of the battlefield. A simple solitaire system allows the recreation of small combat engagements (five to ten units per side) over a bevy of scenarios. Blind chit draws and die rolls, combined with artfully crafted charts create an impressive “artificial intelligence,” embuing the game with a true fog of war. The rules are generic enough to cover many periods and genres (the World Wars, Classical Battles, Science Fiction, Fantasy, and more), but the units (American, German, and Russian) and scenarios are specific to the European theatre of World War II, focusing on the years 1942-1944. 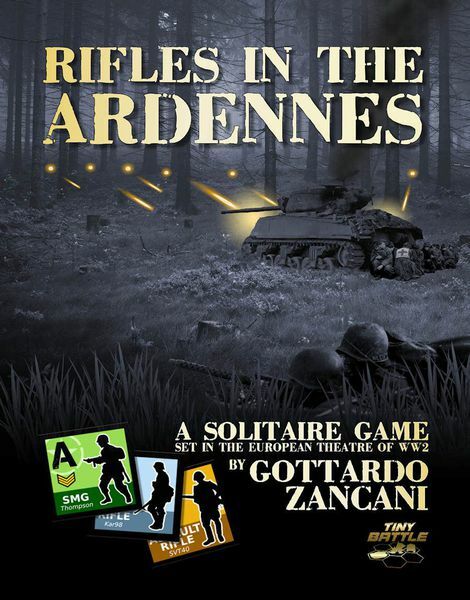 A fast paced and exciting solitaire World War II game, Rifles in the Ardennes offers electrifying combat action in a tiny package.